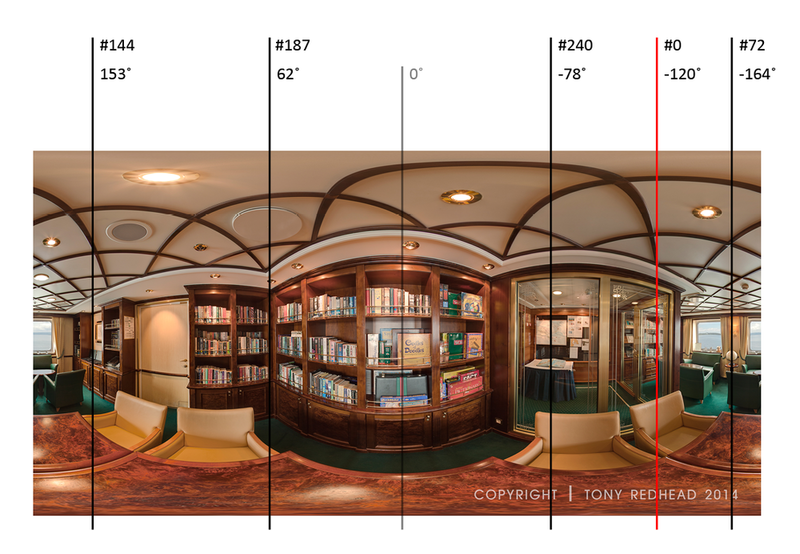 Panolapse is a software program that allows you to animate stitched 360˚ panoramas. This is a step by step tutorial showing how to use Panolapse and create a short, 10 second clip, panning around a library, changing the zoom as we pan. If you'd like to purchase Panolapse here's a referral link that you can use, Buy Panolapse Now. UPDATE June 2017: Panolapse have just released Version 1.25 available for download Mac or Windows. This versions adds AutoExposure support for manual lenses and various minor fixes. 3. Selecting your image opens the Lens Setting window. 4. In the Lens Setting window set the following parameters and select Done to finish. Before we start creating the key frames there is a serious bug that you need to be aware of. It is caused by the change from negative angle values to positive angle values and results in the pan moving in the wrong direction. The following image illustrates the key frame positions this tutorial will use to pan around the image. It shows the frame number and the corresponding angle value on the panorama. The red vertical line indicates our starting point at frame #0, the angle is -120, the second key frame at #72 is also a minus angle, -164. The next key frame, #144 has passed the 180˚ mark and is now a positive angle. Frames #187 is also positive while the final frame #240 is negative. The bug will occur, if after the last negative angle key frame, you use the keyboard to enter any new key frame data whether it be to create a new key frame or change an existing key frame. So I can create keyframe #0 and key frame #72 by clicking in the key frame data entry area and typing in the required pan, tilt, roll or zoom information. Frames #144, #187 and #240 can only be set by using the mouse controls. If you follow these guidelines you can create a properly executed pan. Versions before 1.6, with the option to save key frames to a file, would exhibit the pan error when the key frame file was loaded regardless of the way in which the key frames were created. This has been fixed in 1.6 and loaded key frame files execute the pan properly however another small bug has been introduced that results in every key frame checkbox being checked. Both bugs have been submitted to Panolapse and they are being investigated. When the image loads there are two keyframes automatically preset. Frame 1 and the last frame, in this case Frame 240. In this example we will start at a different location to the default, at the door to the library. 6. Use the mouse pan the image to where you want it to start or key in the relevant Pan, Tilt, Roll or Focal Length coordinates. 7. In this case enter -120 for the pan. The Tilt, Roll should be at 0 and the Focal Length field blank. 8. Now move the Animation Slider to the last frame and uncheck the Key checkbox. Tip: you should always work in a linear sequence to avoid unwanted movement in your video. Unchecking the last frame will help with this. 9. Start the animation by setting the second keyframe at 3 seconds. Use the scrubber to move to frame #72. 10. Check the key box at frame #72 to activate the coordinates. 11. Set the view by panning to the globe on the small table. In this frame we will change the Focal Length and zoom in on the globe. In order to use zoom check the box next to Enable Zoom. 12. As this key frame is still a negative angle you can use the keyboard to enter all of the coordinates. Note: If you wish to use a mouse the commands are, Left-click to Pan/Tilt, Right-click to Roll and Mouse-wheel to zoom. 15. The next keyframe is at 6 seconds, use the scrubber to move to frame #144. 16. Use the mouse to pan to the location you want at this key frame. You will see that the Pan angle is now a positive number this means that you can only use mouse movements to set coordinates from now on, including changes to key frames at negative angles. 17. My settings are 150.01 | -10.01 | 5.69 | 40, just aim for something close. 18. View the action by selecting the Preview button (version 1.6) or dragging the scrubber. You will notice that the transition from key frame #72 to key frame #144 works as expected. 20. My settings are 57.77 | 5.72 | 9.05 | 20, just aim for something close. 21. View the action by selecting the Preview button (version 1.6) or dragging the scrubber. You will notice that the transition from key frame #72 to key frame #144 and key frame #180 as expected. 23. My settings are -86.94 | -0.48 | -1.63 | 50, just aim for something close. 24. View the action by selecting the Preview button (version 1.6) or dragging the scrubber. You will notice that the transition from key frame #72 to key frame #144, #180 and key frame #240 as expected. 25. Before rendering save the keyframes in case you need to reload them in the future. Select Edit / Save keyframes to file ... Tip: Saving the keyframes is a good habit to get into. 26. Select the button "Export frames..."
29. Set the output folder and select "Queue for render"
31. Panolapse will now render individual images for each frame and automatically compile them into an MP4 video file. 32. Navigate to the folder you defined in the Output Folder setting. There will be all of the frames from your render and a MP4 video file. Play the video in Quicktime to review it.